My last couple of posts on Yosemite in springtime followed a theme of some sort, rockfalls or waterfalls and such, but I also just plain saw a lot of beauty derived from the bounty of water at this time of year. The nice thing about a place like Yosemite (and any other kind of park) is the richness of color and texture in features big and small. 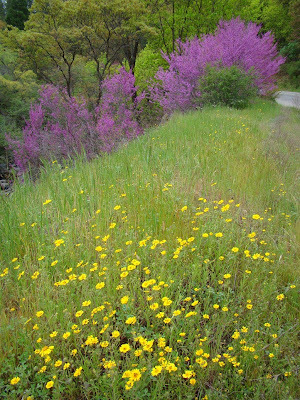 The picture above is of some redbuds that are still blooming, along with a groundcover teeming with flowers of all kinds. It was raining prior to our arrival...moisture was everywhere, including the droplets on the clover by the highway where we looked at Grouse Creek Falls. 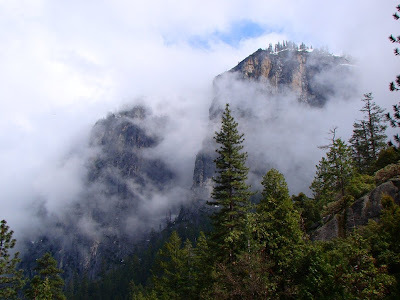 The clouds were moving eastward ahead of us, giving an interesting perspective to the little noticed cliffs around Stanford Point (little-noticed because everyone is looking east to El Capitan, Half Dome, and Bridalveil Fall from the Tunnel View parking lot. It's one of those cases where these cliffs would be world-famous if they were located anywhere else. Half Dome was putting on a show today, too. This view from the Curry Village parking lot is hard to miss, although I almost always get a telephone wire in the picture. 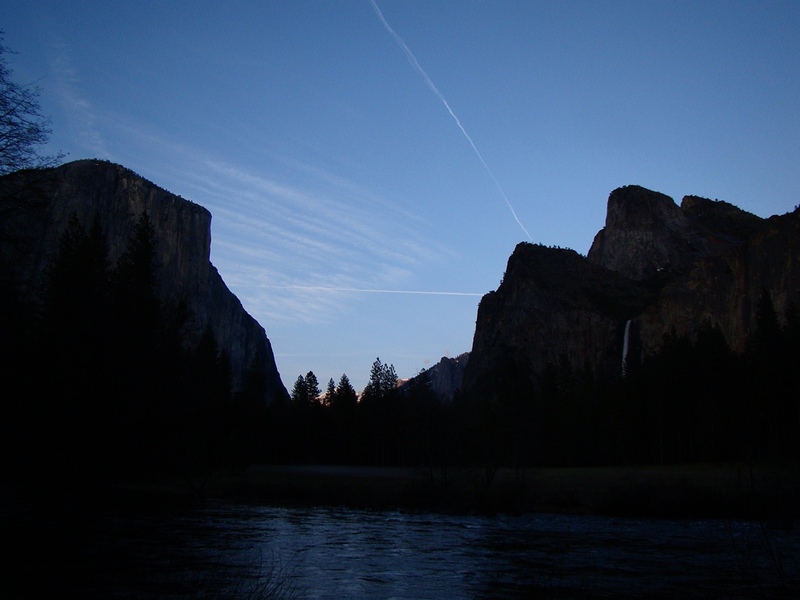 Whose idea was it to string a telephone wire across the view of one of the most iconic rocks in the American West? Tenaya Creek was running full, and will deserve an entire post of its own in a day or two. 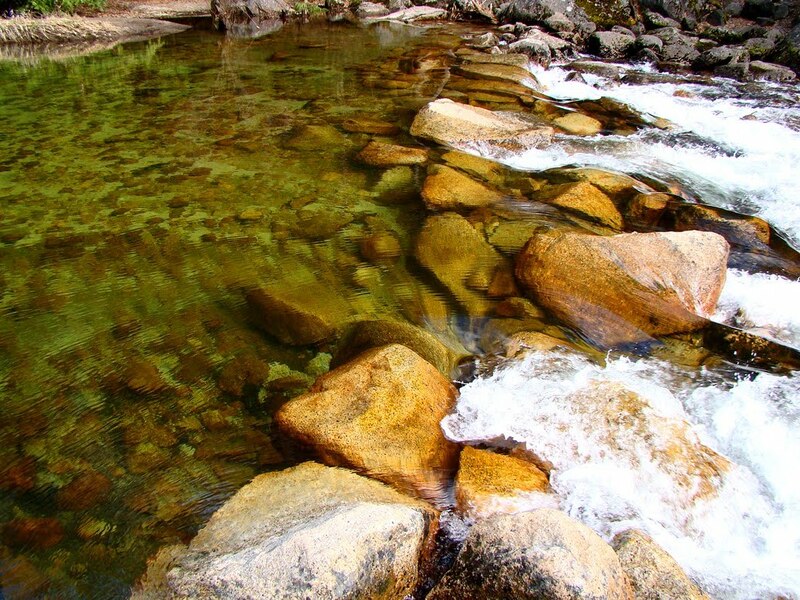 The water is strikingly clear, primarily because the watershed above has been stripped almost entirely clean of soil by the glaciers that coursed through the canyon as recently as 13,000 years ago. 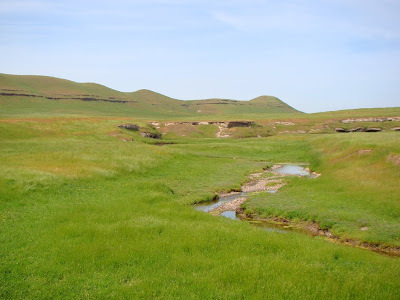 The water flows over barren rock over much of its course and thus carries relatively little sediment. One more waterfall to add to the mix. 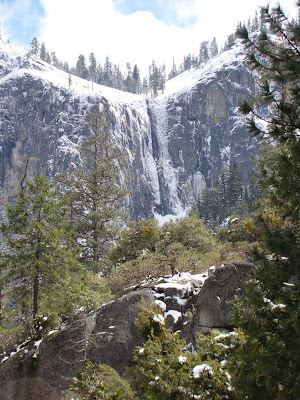 This is Royal Arch Cascade, which tumbles down the canyon wall just west of the Arch. Most people don't see this particular view, as it is a zoom view of just the very top of the waterfall. 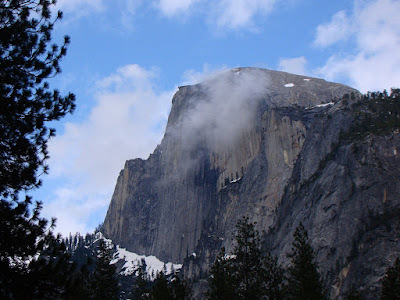 As we left the valley, we made a brief stop at Valley View, another one of the iconic views of Yosemite just west of the "Gateway", the towering cliffs of El Capitan and Cathedral Rocks. Jet contrails usually screw up pictures of nature, but there seems to be a kind of symmetry to the ones seen here. 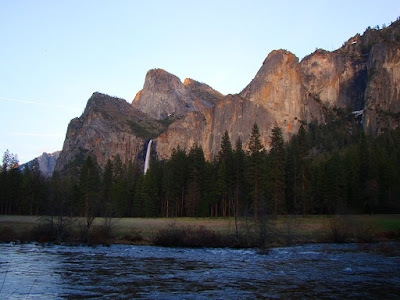 Yosemite Valley is justly famous for its beautiful waterfalls, and literally billions of pictures have been taken of them over the years (and that's just counting me). 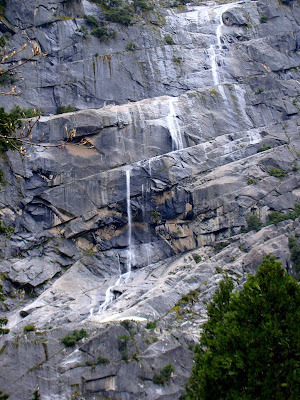 Bridalveil Fall (above) is one of the most visible and popular. 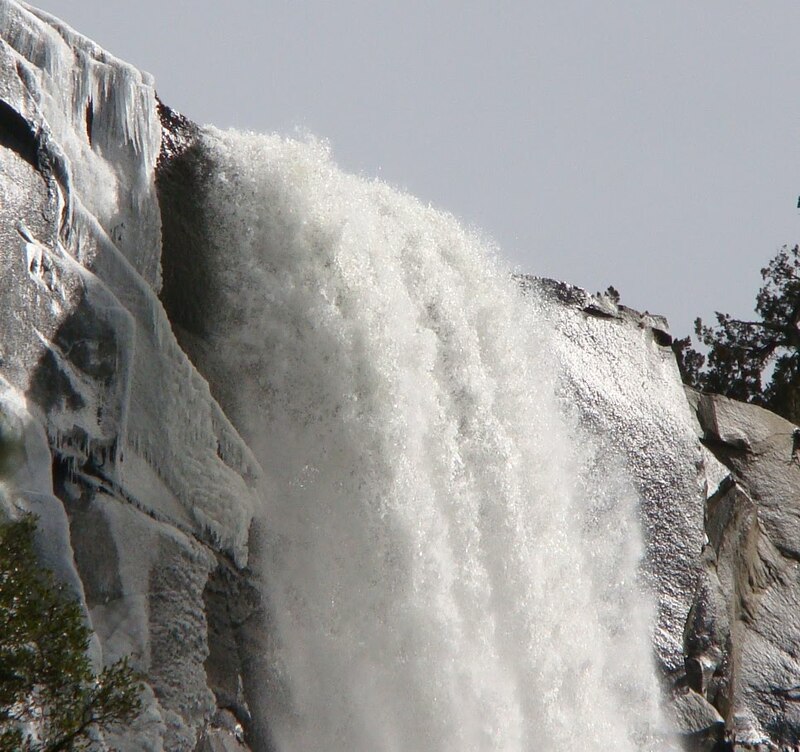 During the spring runoff the falls run fast and cold and are the main reason most people are visiting Yosemite right now. It's too early for the flowers, and the high country is still wrapped in a deep, almost record-breaking blanket of snow. 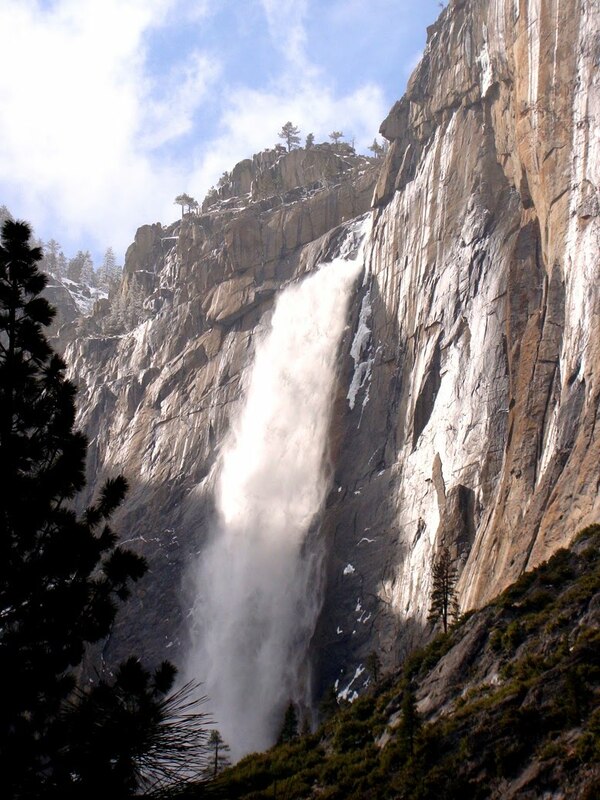 Although the eyes are drawn to the famous and familiar falls, springtime is a good time to see some of the less famous ephemeral falls that in any other place would be the center of attention. This last weekend, after chasing down rockfalls in the Midpines area, we made it to Yosemite Valley. This particular day I was able to discover a new thousand-foot high waterfall for the first time, and I caught another of my favorites from a new angle. While I was standing...er...in the middle of the highway, I realized I had a fine view of a fall I had not noticed on previous trips...it is informally called Widow's Tears, and it drops over 1,000 feet down a series of ledges. There is some confusion about the name. 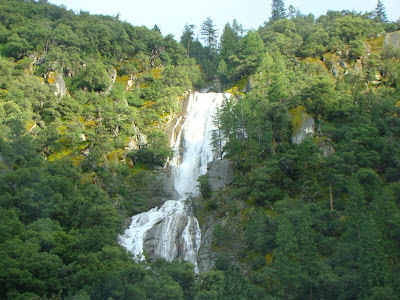 As Mike Osborne reports in Granite, Water and Light, the name Widow's Tears once graced what is today Silver Strand Falls. 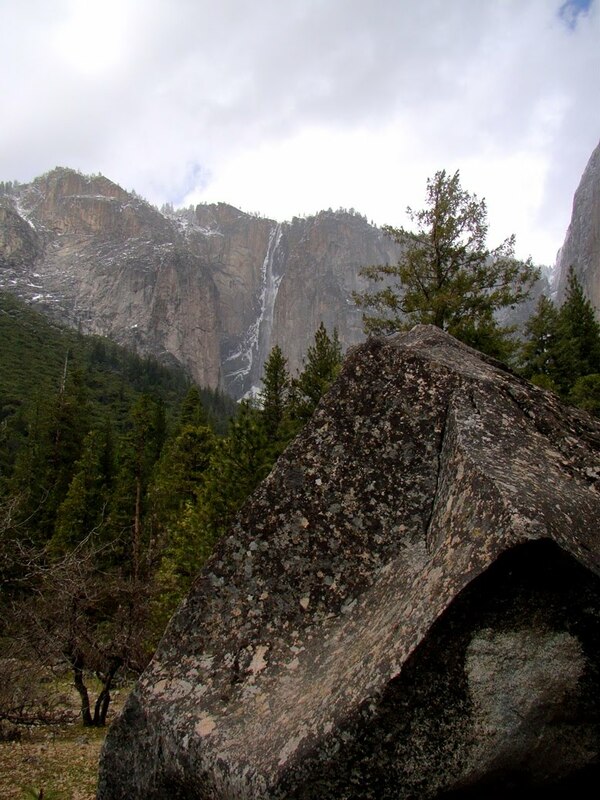 The name was officially set aside in the 1920's, but in the 1970's ice climbers gave the name to this ephemeral cascade in the alcove just to the east. The northern shady exposure provides some excellent winter climbing opportunities. 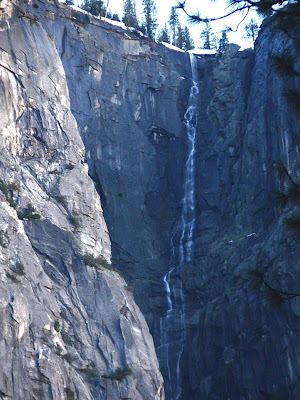 If you ever sit down for a pizza in the plaza at Curry Village in springtime, be sure to look at the cliffs below Glacier Point for a view of one of Yosemite's really unique ephemeral waterfalls, Staircase Falls. The rocks have a prominent set of diagonal joints that force the water to fall over a series of ledges that cause the waterfall to go sideways around 1,000 feet while falling about 1,300 feet vertically. 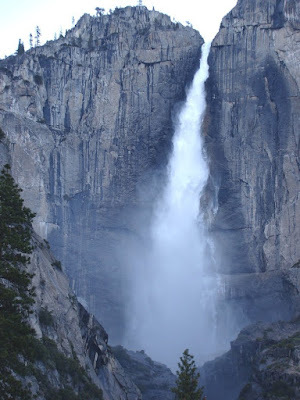 Lest you think that I totally ignored the famous waterfalls, I most certainly did make a stop at the base of Yosemite Falls to catch the spray. The falls were booming away, but as I watched the beautiful spectacle, I realized it has been a rather cold spring. 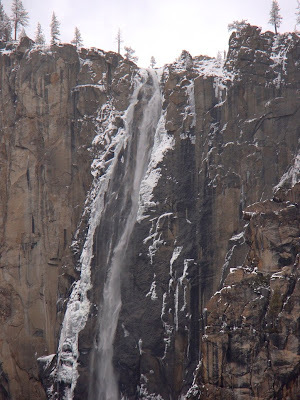 Most of the snow is still up there in the high country, and when the warm days come, these waterfalls are going to get even bigger. The temptation will be hard to resist, so expect a few more on-site reports in the next few weeks! 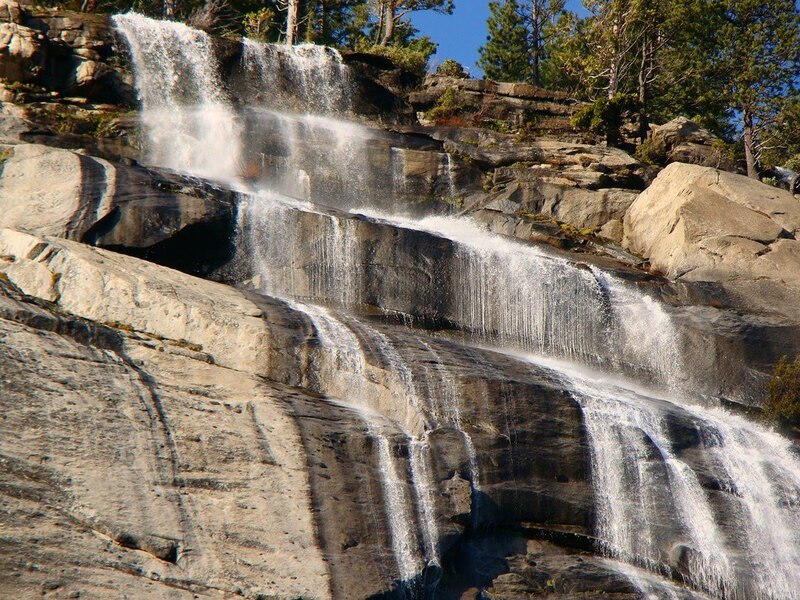 Headed up to Yosemite Valley today to see some waterfalls and enjoy the holiday. Had a wonderful time, but had an extra surprise. Got to see a modest rockslide on Highway 140 on our way there, and managed to catch it on video! 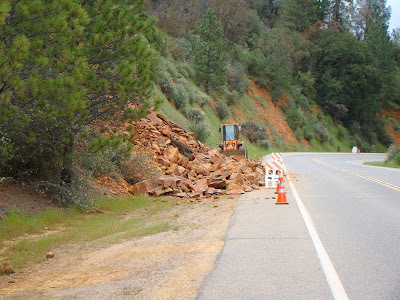 We were driving down Highway 140 near Midpines on our way down to the Merced River when the new rockslide caught my attention. A lot of rock had already fallen, and given that there was a bulldozer parked on the other side, it was clear that the main event had happened a day or two earlier, but I decided I wanted a picture so we stopped and I hopped out. The picture above is the only shot I got before the slide. The rocks on the lower part of the roadcut are probably greenstones, metamorphic volcanic rock, while the unstable material above is metamorphic slate. Both are part of the late Paleozoic Calaveras Complex or Sullivan Terrane. The material was deeply weathered (thus the red coloration), which contributed to the slope instability. 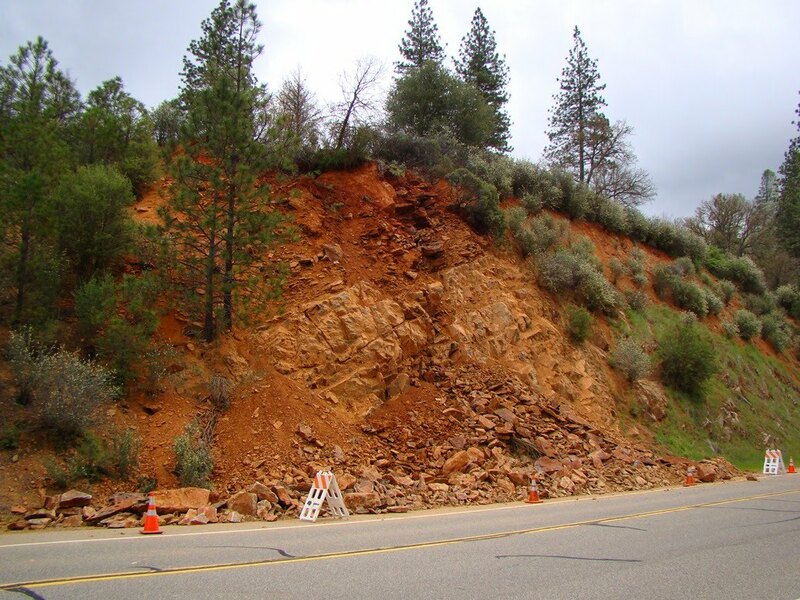 Further instability was introduced by having a roadcut in the first place, which oversteepened the slope, and by the tremendous amount of precipitation we've had this year, around 150% of normal. 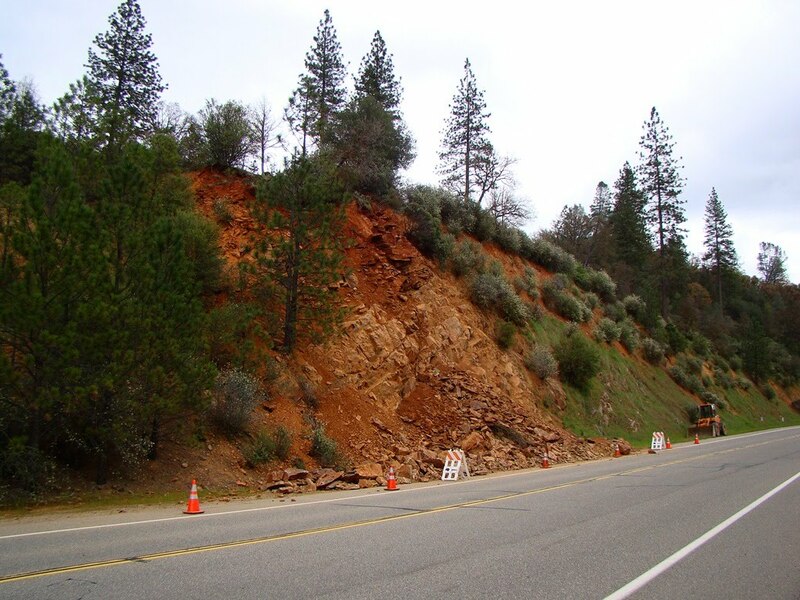 There were numerous other examples of recent slope failures along the entire Highway from Mariposa to the entrance of Yosemite National Park. Sure, it wasn't the biggest slide in the world, but it was very loud, and it was very cool to be standing in front of it when it happened. You can hear me starting to say "I'm O.K." at the end of the recording, mainly because my wife was down the road a bit and heard the rocks drop, but couldn't see me. I come crawling to the end of a long semester, and finals week looms, starting tomorrow. I've been wading through a massive pile of laboratory manuals and quizzes for the last four days. I'm having so much fun. It's time to revive the character who appeared on this blog last year about this time, a return at least as welcome as federal tax deadlines and lawn weeds. Professor Incognito is the creation of Zeo at ranthour.com, an artist who refuses to reveal the inspiration for her professor character. I certainly know it couldn't be me. I mean, I would NEVER say things like this...well...almost never. Anyway, I must say that once again my students have exhibited a great deal of restraint in terms of begging for a passing grade. They mostly seem to know where they stand. 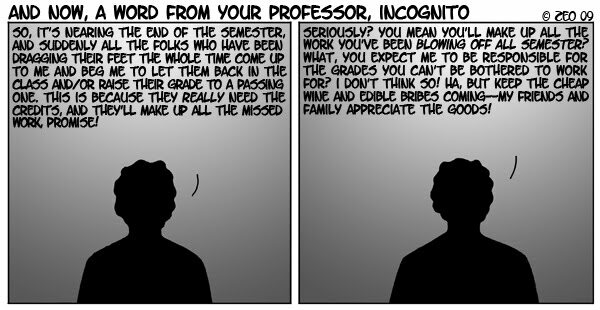 But with finals coming up, I figure it can't hurt to clue them in as to what might happen if they try to con a grade they don't deserve. After all, they are ALL reading this blog, because I told them at the beginning of the semester that it would be fun and interesting to read. And who ever ignores advice from a professor? Especially my fine students, and in all seriousness, I have some stellar students this year. It actually has been a pleasure working with them, and they will be missed. 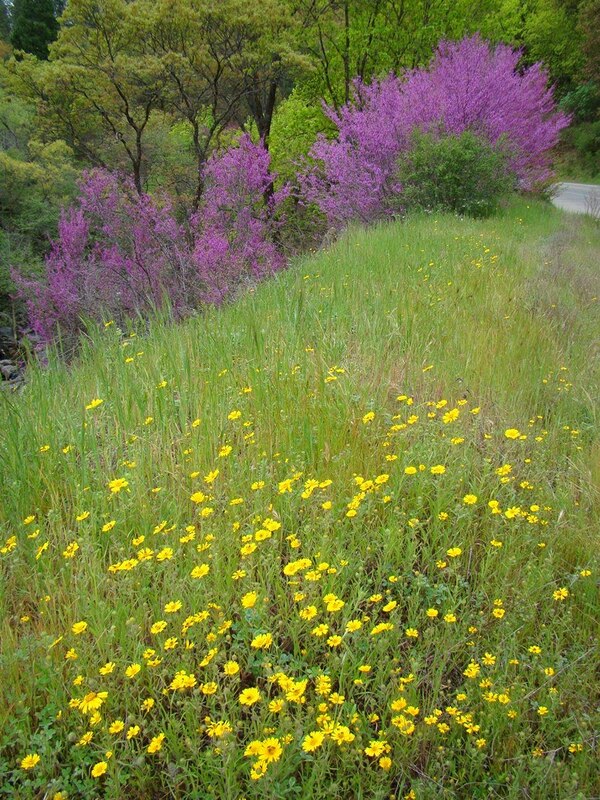 The gentle wind caresses the waving blades of grass...meadowlarks sing, frogs chirp...it's a serene day in the springtime of the Sierra foothills. Of course the science of geology holds no such sense of peace. Almost every aspect of this peaceful view speaks of violence, both in the recent past, and in the depths of time. Take the layers revealed in the gentle slopes of the first picture above: a few terraces of dark rock on the distant skyline and some white exposures near the creek. These are two of the distinctive strata that make up much of the Sierra foothill slopes near the Central Valley, the Mehrten Formation and the Valley Springs Formation. The Mehrten layers resulted from numerous volcanic mudflows (lahars) and floods caused by eruptions of andesitic volcanoes in the vicinity of the Sierra Nevada crest in Mio-Pliocene time. Events that form layers like these are no picnic. Volcanoes of the 20th century like Mt. St. Helens and Mt. Pinatubo of the Philippines produced destructive mudflows that caused damage dozens of miles away from the volcanoes. Likewise, the Valley Springs Formation speaks of volcanic violence. In Miocene time, around 20 to 30 million years ago, huge rhyolite caldera eruptions rocked the American west. A single eruption was capable of producing hundreds of cubic miles of volcanic ash that buried thousands of square miles under a stiflingly hot layer of what amounted to microscopic glass shards. The layers of the Valley Springs Formation record a number of violent eruptions, some relatively close, such as at the Sierra Crest, but some of them originated from ash explosions in eastern Nevada. Today, the differentially eroded layers provide shelter for burrowing owls and swifts along the small creek above. 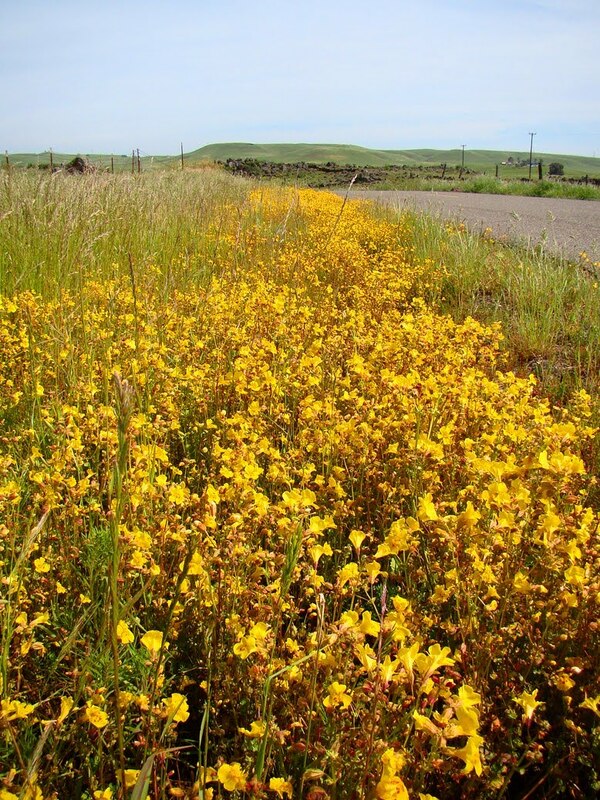 Roadside runoff provides a bit of extra moisture supporting a thicket of monkeyflowers along Willms Road near Knights Ferry (above). But again, the landscape reveals a bit of geologic mayhem with the black boulders of the Table Mountain lava flow in the distance. 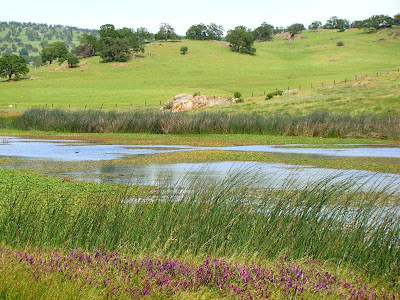 A favorite stop of ours on our seasonal treks through the foothills along Willms Road is a small stock pond a few miles south of Knights Ferry. 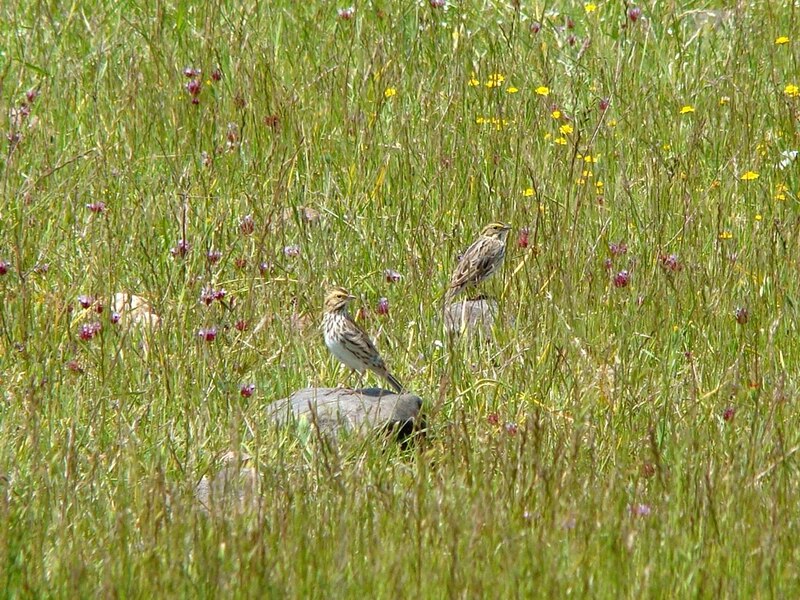 At this time of year the flowers and birds are plentiful. The cattail marsh on the far shore was filled with chattering birds of all kinds. A peaceful, if raucous scene, but once again the present-day scene reveals a history of violence. The bits of rock sticking out on the lakeshore and far hillside are exposures of the Jurassic (yes, that Jurassic, the dinosaur period) Gopher Ridge Volcanics. These are andesitic and rhyolitic rocks that formed volcanic islands along subduction zones in the Pacific Ocean many miles away. Not only was there the violence of the original eruption, there were also the tectonic movements that carried the island arc into the western edge of the North American continent. The rocks were jammed into the continent, deformed, and metamorphosed into greenstone and slate. The timing doesn't have to be measured in the millions of years. A look at the grass stuck in the fence (above) reveals that the road was inundated three and four feet deep during one of our intense rainstorms a month or two ago. The flooding obviously didn't do the road a whole lotta good either. The frogs in the creek seemed fine, but unfortunately they reveal a certain level of violence, this time to the ecosystem of the foothills. 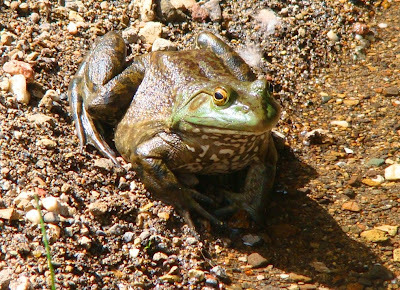 Bullfrogs are an introduced species. 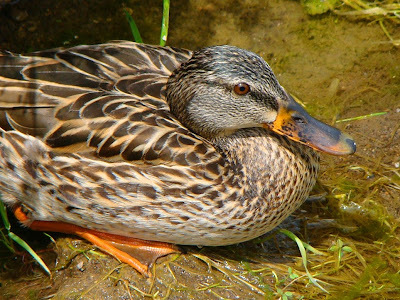 They are voracious predators of other frogs and the native species have not been able to compete. They have driven the native species into a few refugia where the bullfrogs can't survive (even there, the native frogs have problems; they are eaten by the introduced species of fish as well). 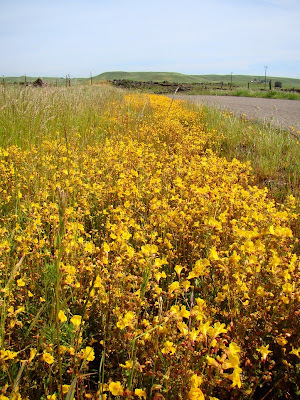 We went out to investigate springtime in the California prairielands, up around the margins of the Central Valley just short of the foothills of the Sierra Nevada. 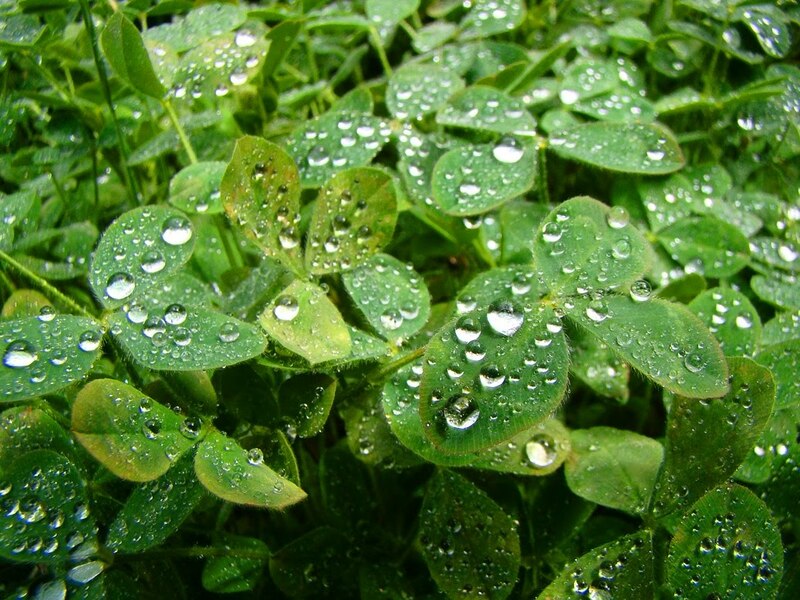 There is a pretty sharp demarcation of spring and summer in this Mediterranean climate; the subtropical belt of high pressure shifts north and shuts off the rains coming out of the north, bringing higher temperatures. All the sudden it is dry and hot for six months or so, almost without exception (the exception being the occasional tatters of a hurricane out of Baja California). 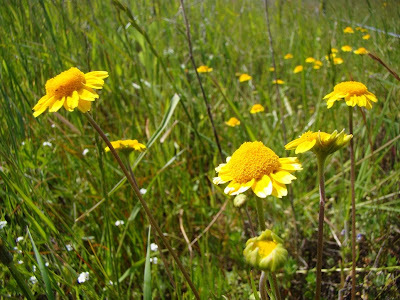 In those warm days of springtime there is an explosion of life on the grasslands. The first picture above shows a vernal pool (or a very good representation of one; there were railroad tracks nearby that may have dammed the swale). 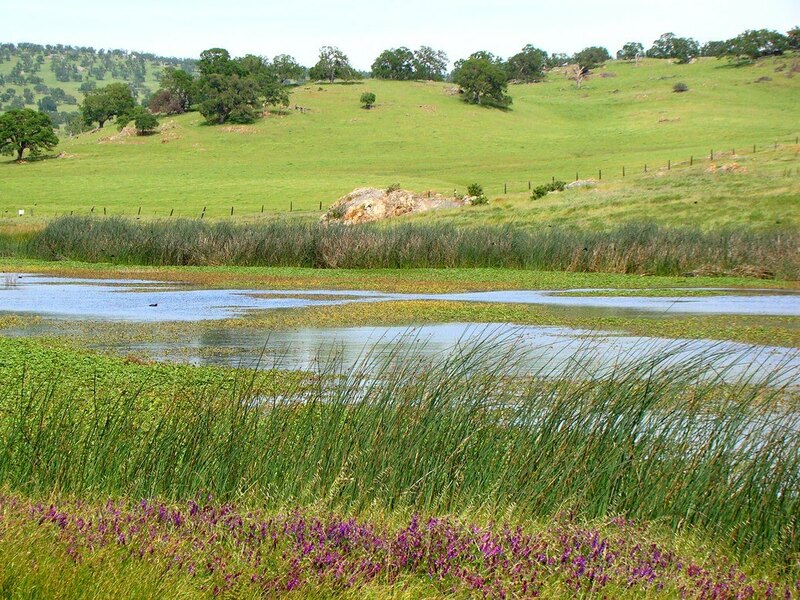 Vernal pools develop on the very old alluvial fan surfaces of rivers that flowed from the Sierra during the ice ages. The muddy rivers spread all over the plains, but when the glaciers melted away the rivers started flowing with clear water. 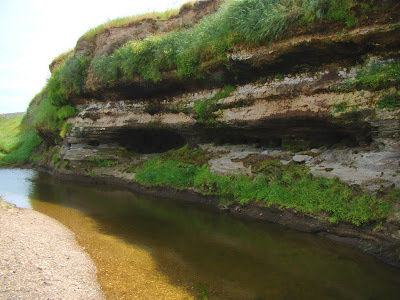 The faster moving rivers carved deep channels and narrow floodplains that they have occupied for the last 13,000 years. 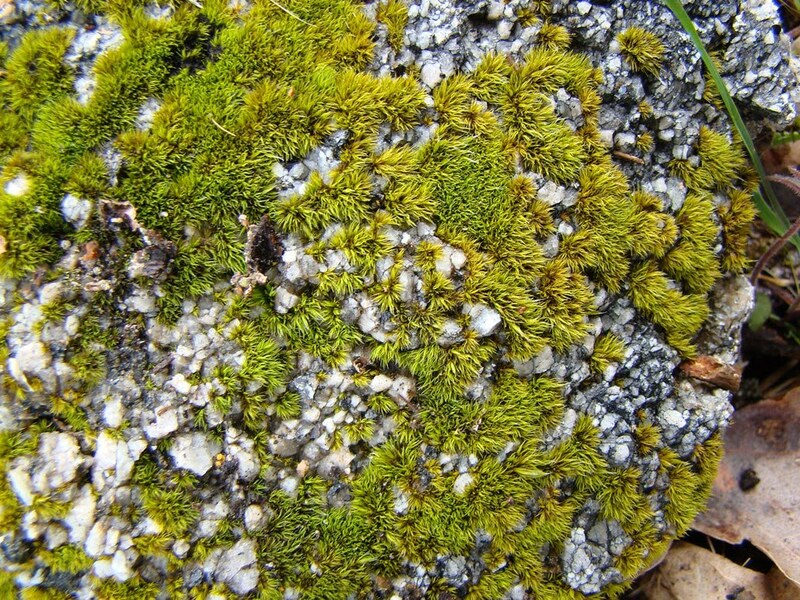 The surfaces above the floodplains are pockmarked with numerous small basins with small interior drainages (caused by wind deflation or differential settling of the soil). The basins are lined with clay that causes water to pond instead of sinking into the soil. The vernal pools are an ecosystem pretty much unique to the Sierra Nevada foothills. You can see a fairly sharp delineation in the vegetation at the edges of the pools. The normal grasses don't do as well being inundated with water for a few weeks in the spring, and being rooted in solid clay. 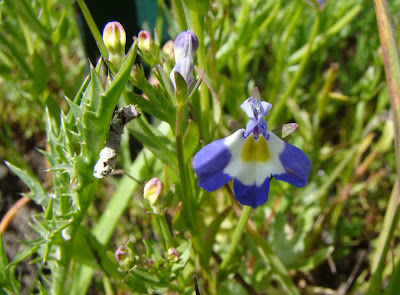 A number of plant and animal species have evolved to thrive in the unusual environment. 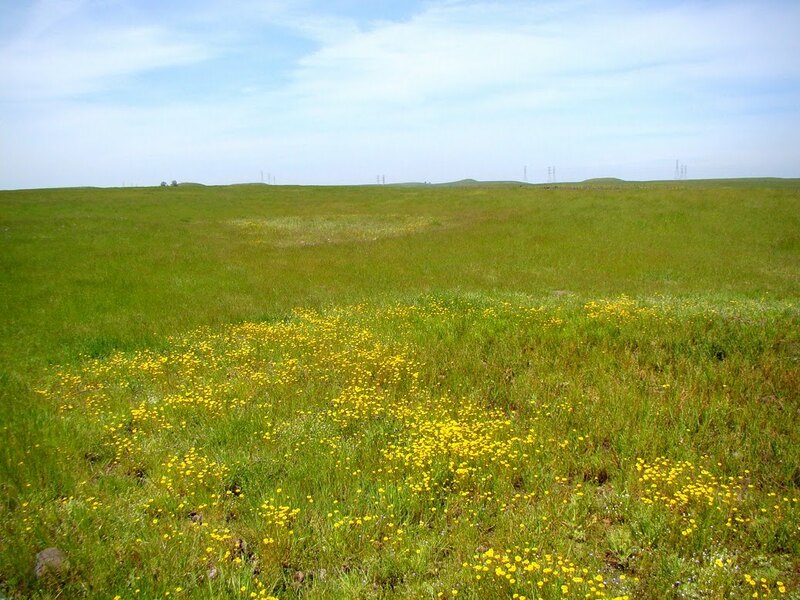 The vernal pools have been decimated by urban and agricultural development; they were a major issue during negotiations for the siting of the University of California Merced campus. 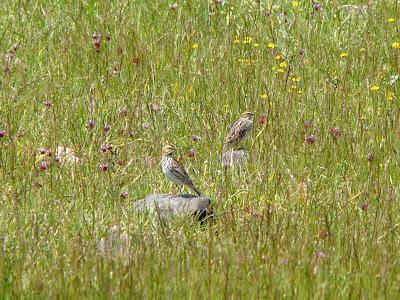 The one we looked at was in a pasture and had been heavily trampled by cattle. A lot of flowers were visible. It's pretty amazing that I can identify dozens of minerals without breathing too hard, but I have a mental block when it comes to any flower called something other than Poppy or Lupine. I'm guessing that this beautiful small blue, white, and yellow flower is a Bacigalupi's Downingia, based on a highly sophisticated internet picture search (looking at pictures is one of those things I tell my students not to do when identifying minerals; look at the properties, I say). 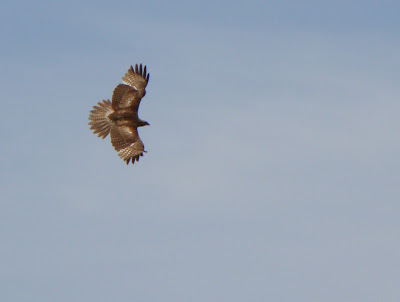 The prairies that I have come to value so much in recent years are clearly under a threat. 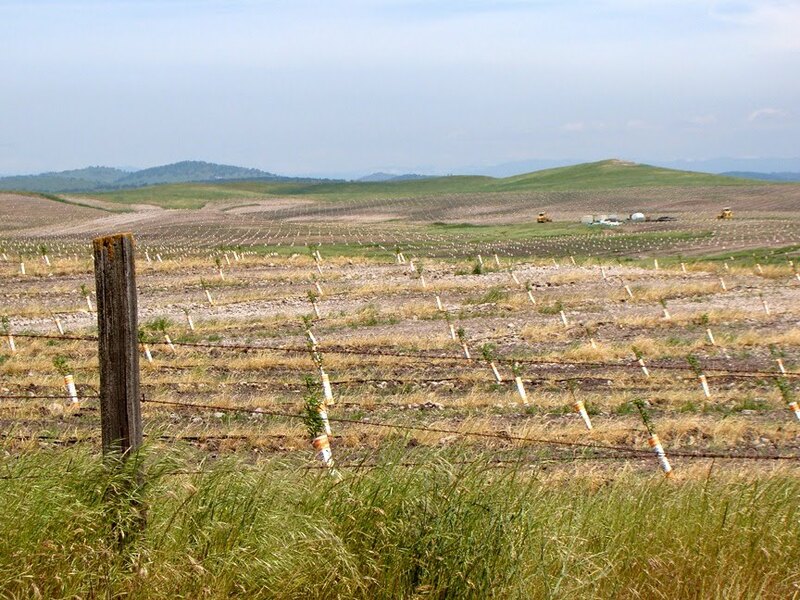 For decades the lands have been used for grazing (for better or worse), but as more and more of the prime agricultural lands in the valley have been urbanized, the farms are moving towards the less favorable soils of the foothills. 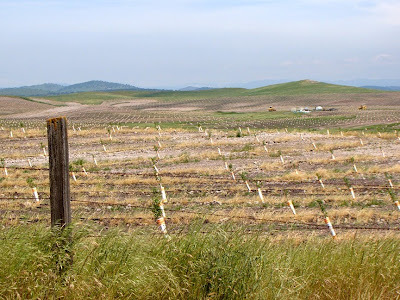 I was shocked by the sudden appearance of hundreds of acres of newly plowed and planted orchards and vineyards. 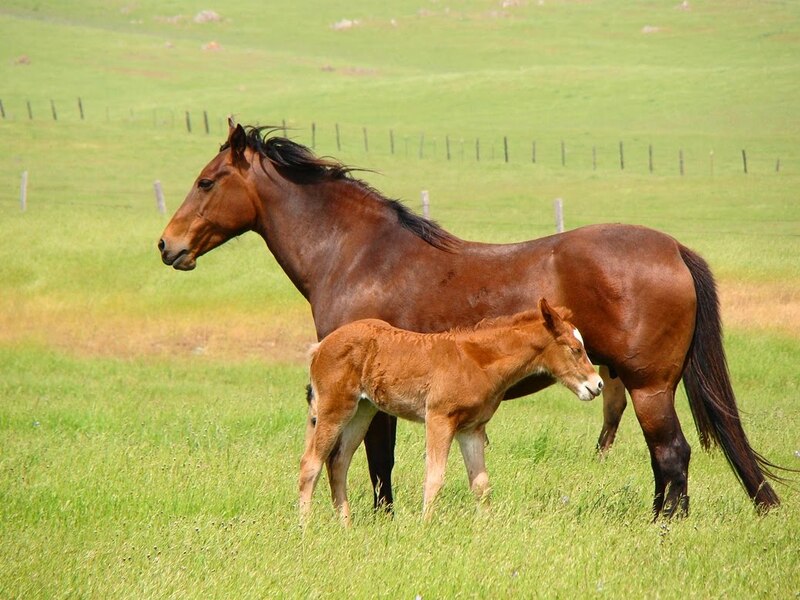 As promised, there were horses roaming the grasslands, and the mares had recently given birth to foals (I say this because I know Diane and Jennifer, my horse-loving friends, will be all up in arms over the title of today's post). There is an interesting geological connection between the horses and the land here. Most of us know that horses arrived in the "New World" with the Spaniards in the 1500's, but fewer know that the horses were coming home after a fashion. 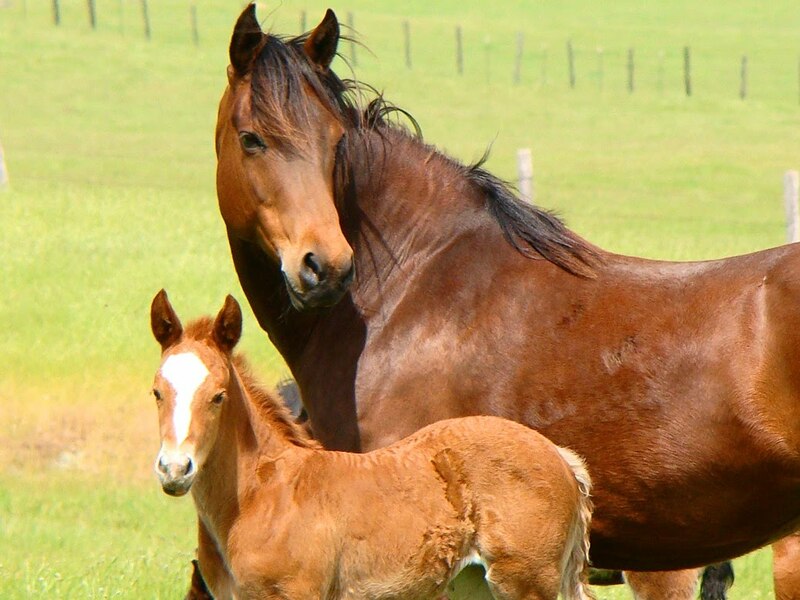 The ground beneath the feet of mare and foal contains the occasional fossil teeth of horses. Some of the fossils date from as recently as 12,000-13,000 years before the present, the time at which the horses became extinct in North America. Other fossils in older rocks beneath are of smaller horses with different teeth and extra toes. The horses evolved in North America, and there have been dozens of species found as fossils (compared to the three that we have today). Some of them migrated over the Bering Land Strait and thrived in Asia, but they eventually went extinct in America, for reasons that are not clear. First-time visitors to Yosemite Valley who enter the park via Highway 140 from Mariposa are treated with views of a spectacular river canyon along with sights of some interesting ongoing geological processes. One of the odd places along the drive is a stoplight in the middle of the highway near Savage's Trading Post, and a narrow bridge that only allows one-way traffic. After a wait of several minutes, the light changes and traffic crosses the river, only to cross over another narrow bridge a short distance later. What's going on? The reason becomes clear when one looks across the river. A vast pile of rock covers the old stretch of highway, and the slope above the debris looks not so stable, with big chunks of rock that seem to be taking aim at the river. This is the Ferguson Slide, one of the real headaches for engineers who designed the highway. The present mess dates to 2006, but the slope had been a problem for years. 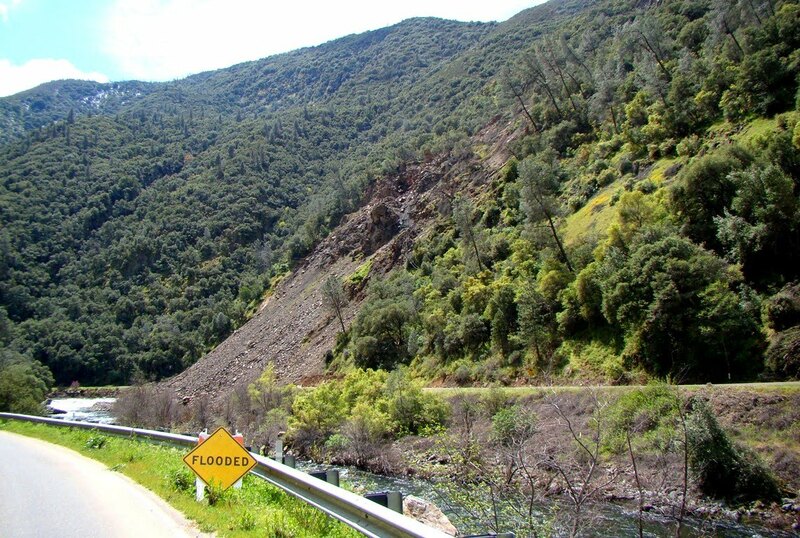 One of my former students who worked for CalTrans kept me posted about the "next thing" they were trying to keep the slope from collapsing onto the highway. It appears that the rock moved as a semi-coherent mass, termed a slump. I think of such slides as mimicking what I do when I hit a recliner at the end of a long day; I slide down into the chair until friction keeps me from moving further. Also, I am usually semi-coherent at that point. 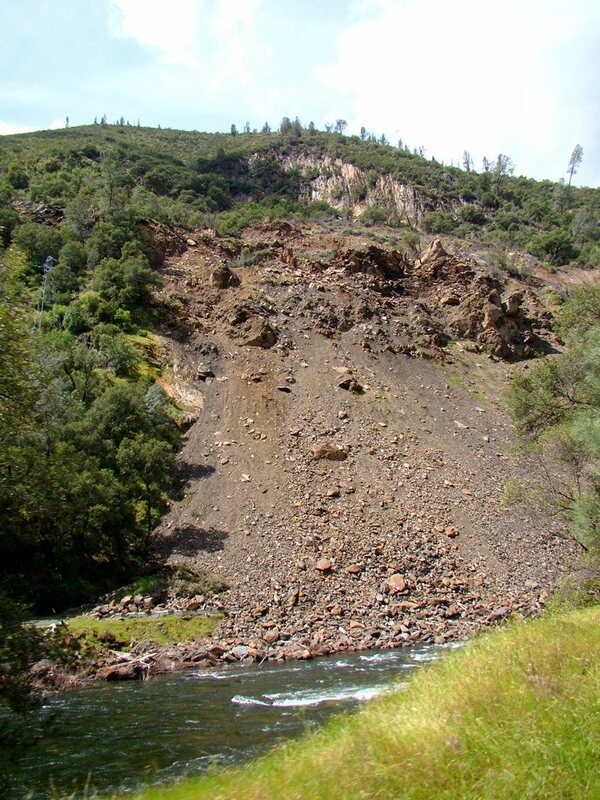 Welcome to the process of mass wasting, the downhill movement of rocks and debris under the influence of gravity. Rivers get a lot of credit for eroding the landscape, but they only cover a very small percentage of the land. Mass wasting processes move material down slopes to where rivers can carry it away. Downcutting rivers steepen slopes, but gravity moves the rocks into the rivers. The Ferguson Slide is just one example of a problem area along the river. 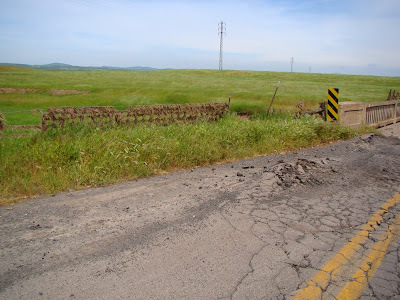 Almost every time I drive the highway, boulders and cobbles from the overlying slopes are littered across the highway. 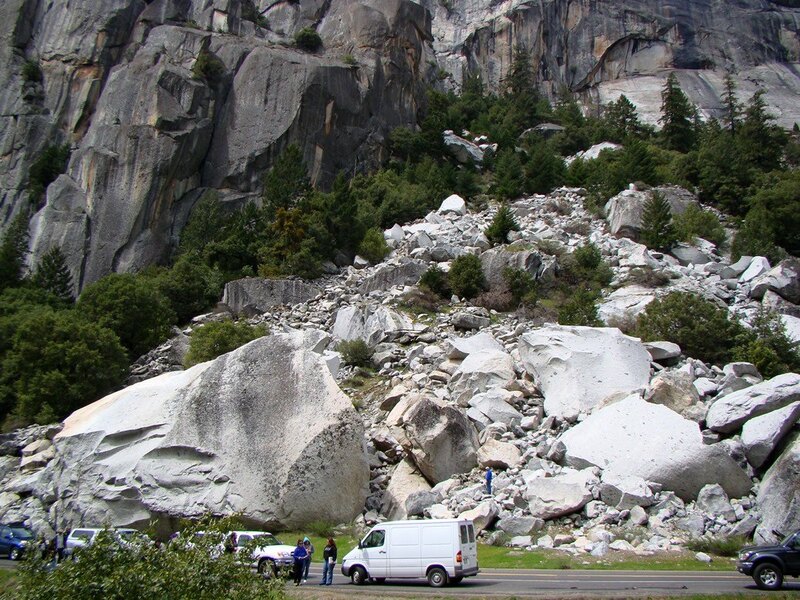 The rocks are ancient volcanic and sedimentary rocks that have been metamorphosed and deformed by compressional forces in the crust related to the subduction zone that once existed in Central California. The rocks are cracked and fissured and are naturally unstable on the steep slopes of the deep canyon. There are few flat places on the valley floor near the river, so roadcuts contribute to the instability of the slopes. The Ferguson Slide has been active for years, as the scarp at the top of the slide is thousands of years old. There were (and still are) fears that the slope could completely fail, and that a large mass could block the river forming a dam and lake that could inundate developments upstream, and block traffic for years. A mass wasting event of a different sort is revealed along the highway shortly after entering the national park. In this area the metamorphic rock has been replaced by the more familiar granitic rock the typifies most bedrock exposures in the park. Huge boulders choke the riverbed, boulders far larger than the river could ever move. 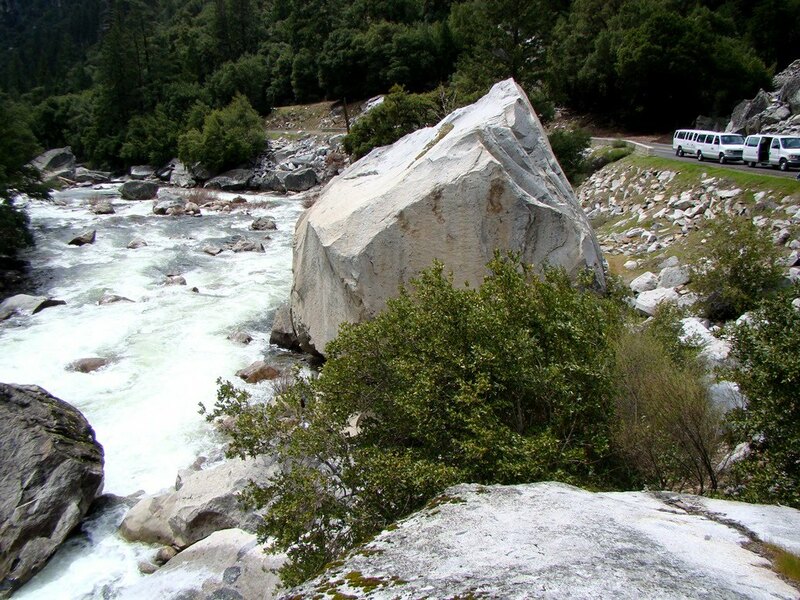 Glaciers can move such rocks, but glaciers haven't been in this particular area for more than 700,000 years. These rocks have no lichens or stains at all; they broke from the local cliffs much more recently. In 1982, to be exact. 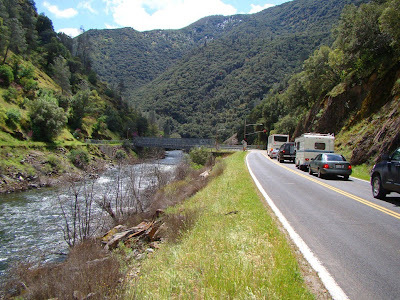 The Cookie Slide covered Highway 140 for months, and broke the main sewer line that served Yosemite Valley (the river wasn't such a nice place to swim for awhile). 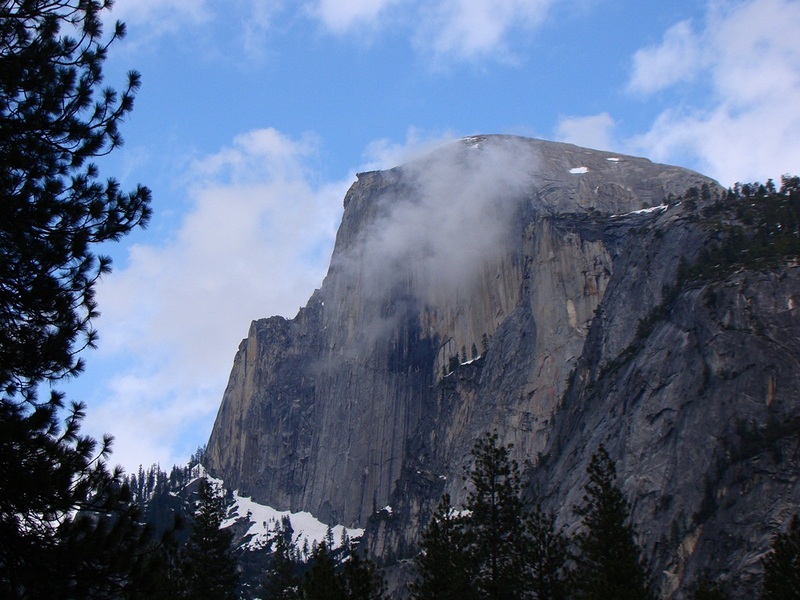 Granite is a very solid rock, and can form cliffs thousands of feet high (the vast cliffs of Yosemite being an example). But on their way to being exposed at the earth's surface by erosion, the rocks expand from the pressure release, and form cracks and fractures called joints. The joints provide an avenue for water to move through the rock, and also provide a surface for slope failures. The rocks detached from the cliff, broke up into a chaotic mass and tumbled and slid down into the canyon. Rock falls and slides are a common occurrence in Yosemite National Park and the surrounding region. These are just two examples, but many more can be found with a bit of research and observation. In my travels, I have heard numerous rocks falling, and witnessed two larger rockfalls (which were described in an earlier post here and here). A few days ago I posted a quiz on Yosemite waterfalls. I didn't get much feedback, but it seems only fair to post the answers and add in a few tidbits of trivia about them, not the least of which is figuring out which fall is the tallest. Yosemite is a unique place, and it has a stunning richness of waterfalls in the springtime. 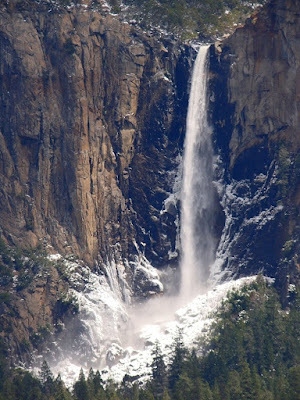 Some of them are below...(along with the answers to our pop quiz) Number one: Silver Strand Fall is 524 feet high, and gets missed much of the time because it is mainly visible from the famous Wawona Tunnel View, but everyone there looks at the panorama of Yosemite Valley, and they don't look high on the cliffs to their right. 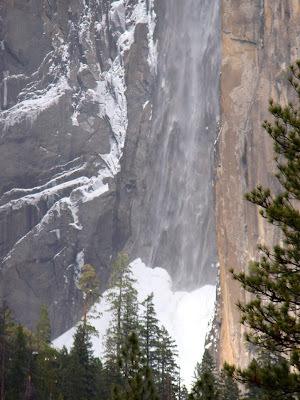 When I was there last week it was actually an ice fall, with barely a trickle of liquid. It flows pretty well in the spring, but dries quickly in the summer. Number two: This one wasn't too hard, except that I purposely hid the dramatic cliffs that surround it and the snow and frazil around the base was unfamiliar looking, at least to me. It is Bridalveil Fall, 620 feet, which is the one visible from Tunnel View, falling from a valley along the Cathedral Rocks. It flows for much of the year, but late in the season the lightest breeze sends the water droplets flying everywhere but down. Number three: I'm not sure this cascade even has a name. 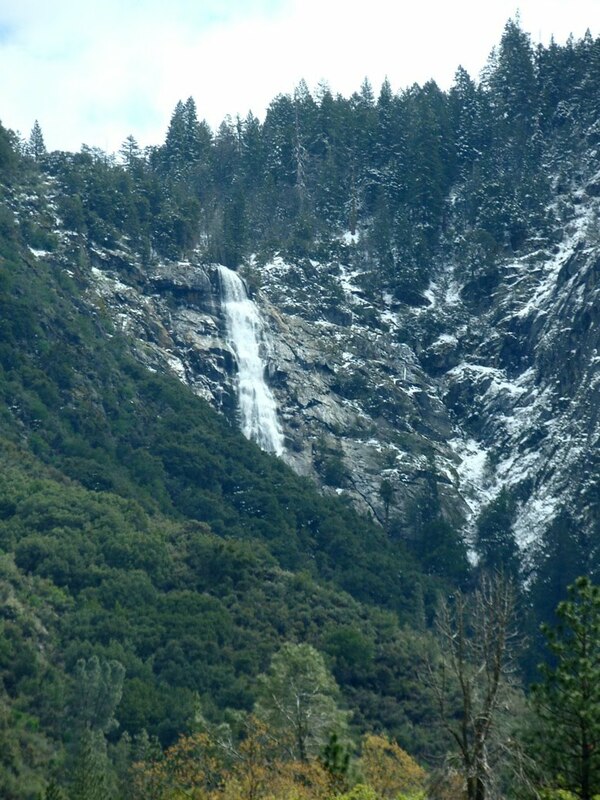 It is visible from the El Portal area, and I think it lies on Indian Creek, so we'll call it Indian Creek Falls (I'm open to corrections, locals!). 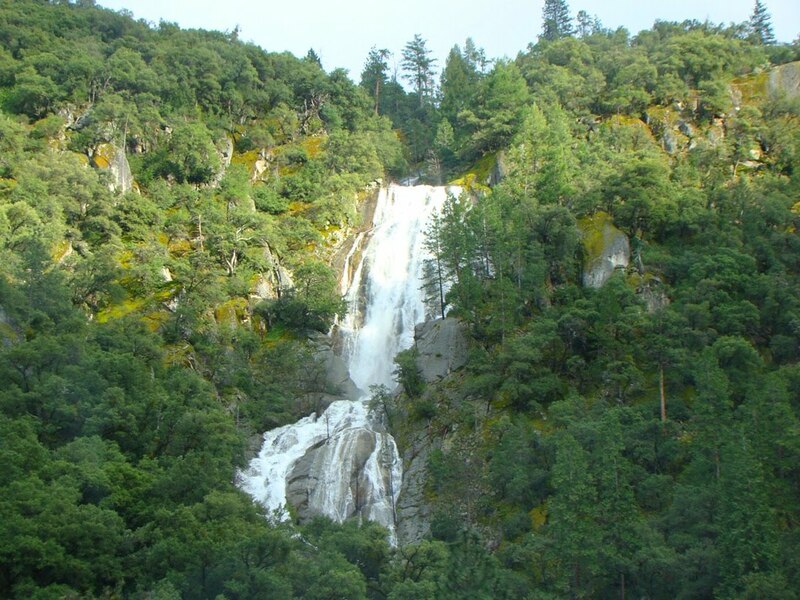 When driving up Highway 140 up the Merced River Canyon, it is one of the first waterfalls you will see, but it is only obvious during the spring runoff. Number four: Grouse Creek Falls (about 200 feet) is also visible (briefly) from along Highway 140 downstream of Yosemite Valley. I usually approach the Valley by way of 140, but I usually leave by other routes. Last week we had to leave along 140, and since I wasn't gabbing over the radio (it would have awakened my slumbering students), I noticed these falls pretty much for the first time. It's the first time I've photographed them, anyway. Number six: It's not this one, though. I tucked in a close-up of the brink of Bridalveil Fall with icicles along the cliff. It was a really cold day! 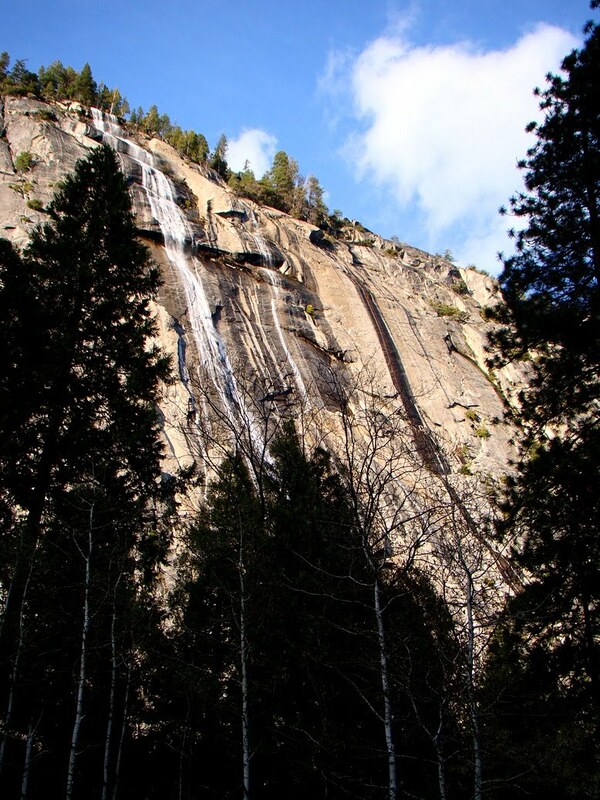 Number seven: This is the base of the tallest water fall in Yosemite Valley. It is called Ribbon Fall, which at 1,612 feet is taller than Upper Yosemite Fall. It's not that it is hard to see. It's right next to El Capitan. The problem is that the watershed feeding the fall is relatively small, and the fall tends to dry up quickly in the spring and early summer, so most park visitors don't see it. Number eight: Here is the top of Ribbon Fall. It is a dramatic drop! I was curious about whether people have bushwhacked their way to the base of the falls and snapped shots from there. 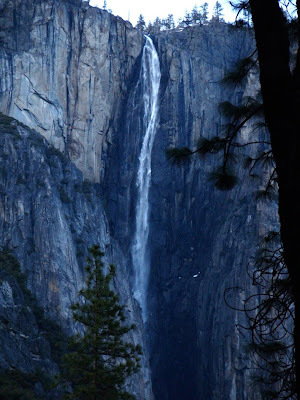 Yosemite photographer Edie Howe (View From the Little Red Tent) pointed out to me that the cover image of the book Granite, Water and Light: The Waterfalls of Yosemite Valley by Mike Osborne is just such a picture. I had just purchased the book last year, and found it to be an excellent (and beautiful) introduction to the familiar and not-so-familiar waterfalls in Yosemite Valley. I recommend both it, and Edie's photography site. Yosemite Valley has such a richness of waterfalls that I could actually put up another quiz with eight waterfalls that aren't pictured yet. It's a wonderful place to visit in the spring (oh, and in the summer, fall, and winter). Garry Gazes at Granite, a prequel to "Horton Hears a Who"
"What color are rocks?" I ask my students, with the intention of highlighting stereotypes about geology. "Gray" is the inevitable answer. I then have them look around the lab, with the many rock samples strewn about, and they immediately realize that rocks occur in many shades. But why is gray always the answer? I usually assume that it is because granite is made of light and dark colored minerals that appear sort of gray at a distance, and granite is the rock that my students are most likely to see in streambeds around our area, but I have come to realize that this doesn't fully explain things. 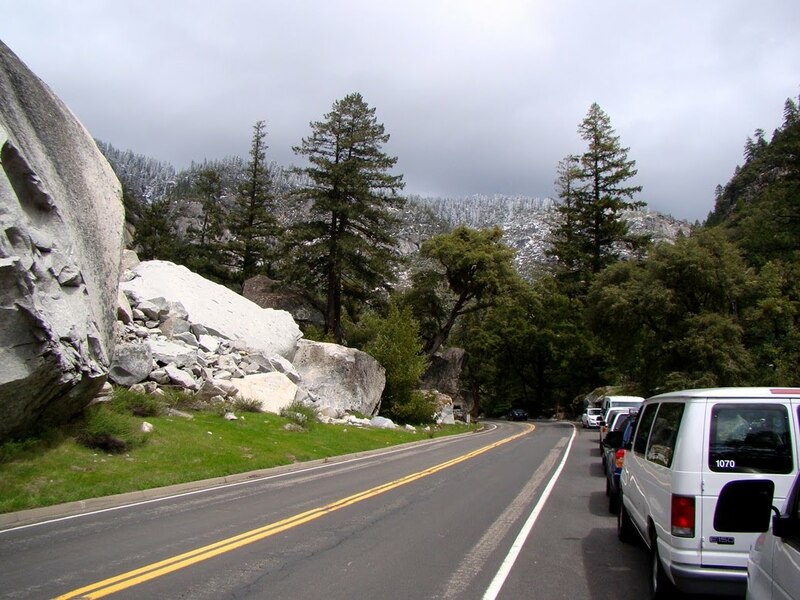 Most casual visitors to Yosemite and other Sierra Nevada destinations rarely actually see granite (or granitic rocks; there are many kinds). Look at the boulder in the picture of Ribbon Falls above. It's a big chunk of El Capitan granite that should be nearly white in color (see the last picture in yesterday's post). Why isn't it? It's covered with...life! Gray life, and lots of other colors too! 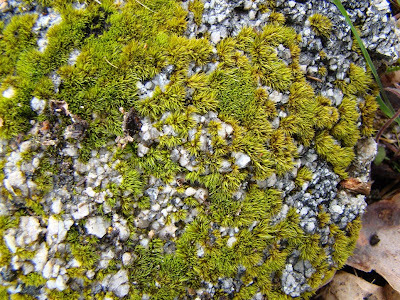 On a finer scale, there is the 'underbrush', the lichens, the symbiotically joined fungi, algae and cyanobacteria that often coat the rock surfaces. 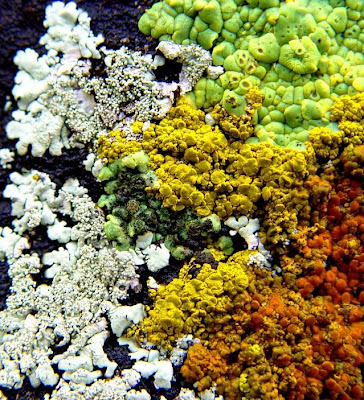 They are a colorful addition to the landscape. 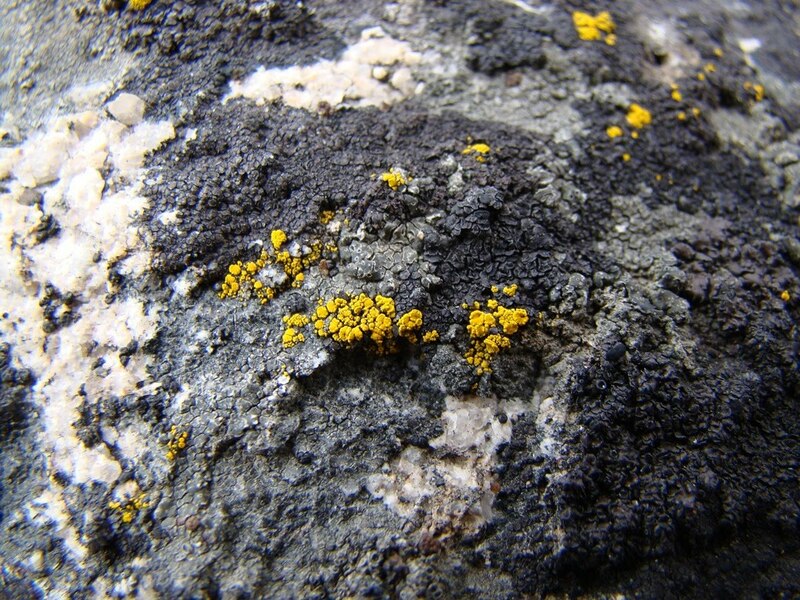 It's intriguing how many complex relationships exist on literally every rock littering the surface of Yosemite. It took me only a few moments of crawling to find numerous colorful examples. 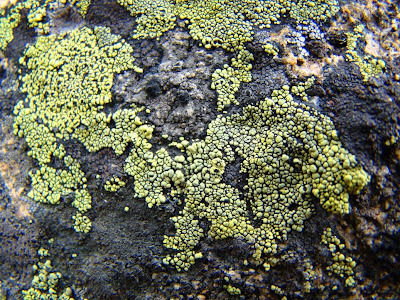 Through a macro setting, the bizarre microworld becomes even more complex (click in the picture to enlarge). "Horton Hears a Who"? I could almost imagine the even smaller creatures living in the small openings! They didn't speak to me today, so you don't need to lock me up... just yet. 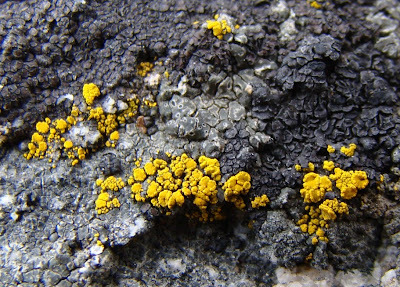 Yosemite National Park has undertaken an assessment of lichens in the park, with more than a hundred species cataloged, and an estimated 500 kinds yet to be discovered. Besides being interesting in and of themselves, the lichens also serve as a way of assessing air pollution damage in the park. Because they are slow-growing, they also serve as a method of dating the surfaces of glacial moraines in Yosemite and other alpine regions. Yosemite is not the only place where numerous lichens can be found; the picture below (from a previous post on lichens in the foothills) shows a veritable palette of colorful lichens in Mojave National Scenic Area. It's one of my favorite photos.